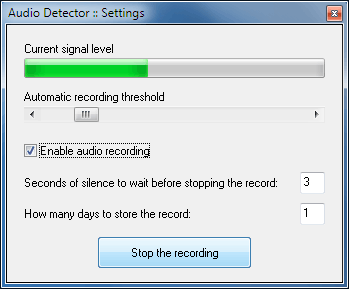 If the sound volume exceeds the predefined threshold, the software "Audio Detector" automatically starts the recording, compressing the sound into the WMA format. Do you still want to know what is happening at that time? The software uses a minimal amount of RAM and imposes a minimal load on the CPU, allowing it to be used even on computers that aren't powerful. 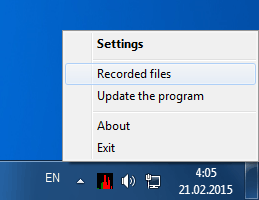 The compression of microphone-recorded sound and the automatic deletion of already-recorded files after a user-set number of days allow avoiding overfilling the hard disk. Surely! The program is distributed on the "Try before buy" principle. Download the program for free and evaluate its astonishing functionality! Note: the free version records first 10 seconds of the audio. I like this software. How can I order the full version? Normally, the entire process is fully automatic and takes several minutes to complete. However, if you haven't received your registration key within several minutes after the purchase - don't worry, most likely your payment is still being processed. If you haven't received the key within some reasonable time, or if you're experiencing some problems ordering the product, please don't hesitate to contact our support@audio-detector.com, we will be happy to assist you! To purchase the program, open the order page and select the most appropriate purchase option. Type the registration key you have received upon purchase in the registration window of "Audio Detector" to remove all limitations! What will I get on purchase? You get the full unlimited version of the program, a high-priority technical support via e-mail (includes usage consulting with our specialists) and all future upgrades for free.